The application-specific functionality such as network configuration, diagnostic display and device manipulation is built on top of the functionality provided by µWeb. Both full sample applications and examples of particular techniques are included with µWeb to provide for rapid development. µWeb provides both C and Tcl application-level APIs, allowing application-specific functionality to be implemented in C (for highest performance), or Tcl (for rapid development), or both! Note: Even on slower embedded devices, Tcl scripting provides high performance (less than 200ms response time) for all but the most data-intensive applications. 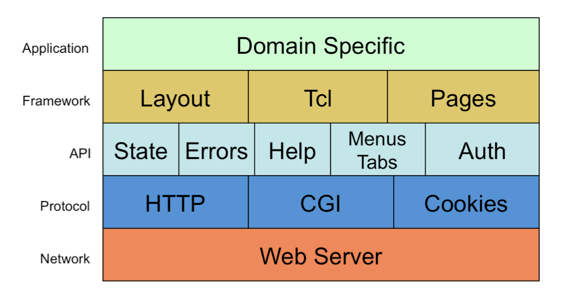 µWeb is far more than a library or a web server. It is a high level framework with support for pages, layout (pages linked to menus and tabs) and the ability to define the behaviour of pages with either C or Tcl “scriptlets”. Also included are common modules for typical embedded device functionality for even faster development. A web application is required to parse and construct various protocols quickly and securely, including http headers, cookies, POST and GET values, multipart-mime encoding and more. µWeb includes fully tested, low-memory, high-performance support for all of these necessary protocols. Source code is provided for the default implementations to allow modification or replacement to support custom requirements. A web application must accept and respond to network requests. A µWeb application can seamlessly run under either the tiny built-in web server, or a separate web server as a CGI application. The unique µWeb architecture along with the comprehensive documentation and included examples allow an embedded web application to be built and deployed in a fraction of the time compared to typical template-based solutions.